Since we actually took a family vacation this year… by car… I had to plan my projects accordingly. I brought a couple drop spindles, which of course were not touched, as well as a few knitting/crochet projects in the hope of making some serious progress during our drives to New York and Boston. Fortunately, I did not drive. In theory that meant I would be able to knit. Unfortunately, I did not drive… which meant I could do little more than sleep. I have the horrible misfortune of getting car sick when I am not driving. This was not made better by the fact that my daughter insisted that I ride in the backseat with her. Not to mention the ridiculous amount of traffic we were stuck in on the way up to New York. But since we are bringing it up, that ridiculous traffic did seem to help my knitting progress incredibly as we were stuck – cars off, not moving – in a tunnel for an hour and a half. Which meant I could pull out the socks I was working on and complete most of the second sock. Sure, it was darkish and the people around us were starting to cause concern as they randomly would call out or honk their horns, but this was the only real knitting progress I made on the trip up. While staying at my sister’s place, I finally admitted to myself that the socks I was knitting were never going to comfortably fit my enormous feet. They were too snug and I wasn’t knitting them at a tight enough gauge to feel like my toes wouldn’t break through the stitches within the first couple wears. 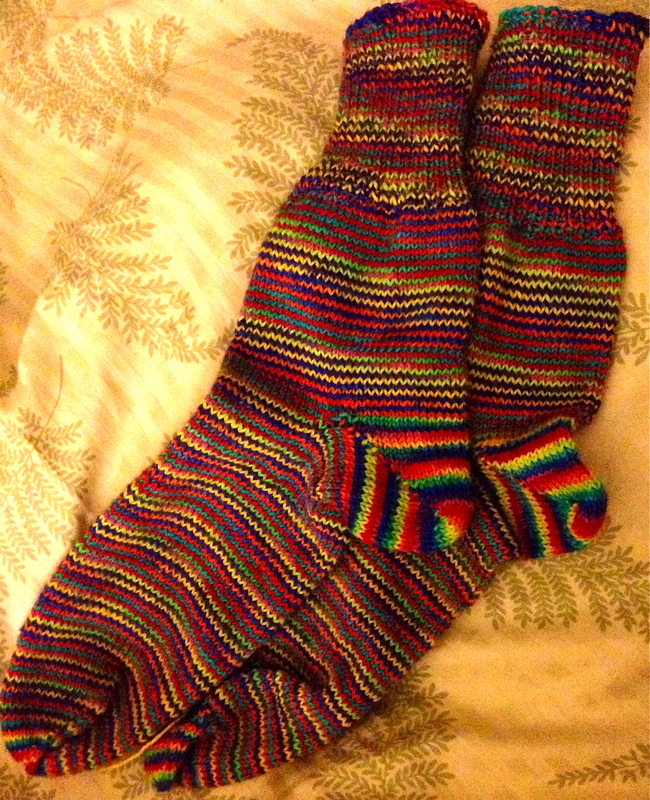 Luckily, my sister lives in a cold climate and is very knit-worthy… and her feet are about a size smaller than mine. The socks fit her perfectly and project 1 was completed. The next project I brought along would not be what I would consider an awesome travel project. I could never work on it in the car as I had to count and watch what I was doing the entire time I worked on it. I also had to bring three gallon-size ziplock bags of fiber fill, which really made my attempt at packing light look like a huge fail. Plus, it was crochet… which is not my strong suit. However, I loved this project. It was my first crochet project that wasn’t flat and it was pretty magically watching it take shape. With a pattern name like “M. 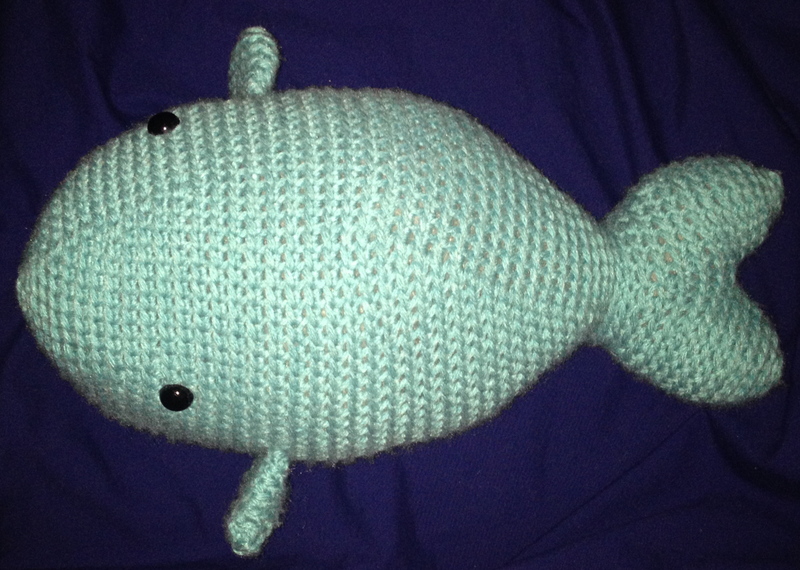 Richard the Whale” and it’s witty pattern description, I was hooked…. literally. Project 2 was completed and then gifted to a good friend’s baby. The final project I brought with me was my Viajante by Martina Behm. At that point, this project had not been touched in at least 6 months. I had been worrying that it would never fit properly at the rate I was increasing and so I moved it on to some try-it-on tubing, soaked and blocked it before we left. I figured I would try it on while we were gone and if I had to rip it all out and start over, at least the relaxing vacation would help ease the frustration. Luckily, I came to my senses and realized it fit fine considering I was only about a quarter of the way through the 2,000 yards of lace weight yarn I would be using. I moved it back on the needles and I was delighted to find that I could work on it without looking. Thus, it was my car knitting for the entire trip to Boston, back to New York and all the way home. We arrived in Virginia, and I arrived at the end of my first 1,000 yard skein of yarn. This project was then kicked into high gear and became my serious “travel” project as I never left home without it and literally worked on it every possible second. I may not have brought my typical small and easy projects, except the socks, but I found that the variety and excitement toward the projects is what was best. None of them were too complicated and all of the knitting was basically stockinette, but there was enough of a difference between the projects to keep me interested and they were simple enough that I could still carry on a conversation or just relax while working on them. In my mind, they were the perfect items to complete my vacation and set me up for success upon my return home…. And that final success will be shown shortly! This entry was posted on August 15, 2014, 11:45 AM and is filed under Seasonal Crafting. You can follow any responses to this entry through RSS 2.0. You can leave a response, or trackback from your own site.